But this was seriously delicious. And meat-free! It’s been on my mind lately, and realized I absolutely had to try to make it…or something close to it. With a little research I found a tomato gravy recipe online, and I had plenty of biscuit recipes to choose from in my 3-ring binder of printed, ripped, and copied recipes for “someday”. 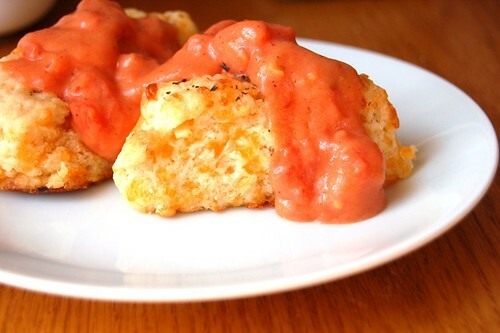 When the biscuits come out of the oven all hot and fragrant and buttery, you smother them with tomato gravy and dig in. Then you close your eyes and go to a happy place. They are that good. Preheat the oven to 450 degrees and center a rack in the middle. Line a large baking sheet with parchment. In a large bowl whisk together flour, baking powder, cream of tartar, sugar and salt. Add the cold butter and combine using a pastry blender or 2 knives, until mixture is coarse and crumbly. Mix in the cheese and onion. Slowly add the milk a little at a time until the consistency is cohesive, but not too wet or sticky. Transfer the dough to a lightly floured surface and knead a few times until the dough is smooth. Divide the dough in half and shape the halves into 9 inch rectangles. Cut each rectangle into 6 equal squares and place on baking sheet, leaving room for them to double in size. Bake for ten minutes, then mix the melted butter and basil and brush on top of each biscuit. Bake for another couple of minutes until they are golden brown. Transfer to a wire rack to cool. Add the flour and whisk until lumps disappear. Allow the mixture to simmer for a moment to “toast” the flour. Add the sugar, salt, and pepper and continue to whisk. Add the can of diced tomatoes or an equal amount of fresh tomatoes, chopped roughly. Continue to simmer, whisking constantly. Slowly add the milk…still whisking. I’ve never heard of tomato gravy, but I am a huge fan of tomatoes and am seriously intrigued after seeing this dish! Oh, and I always call my tomatoes maters. Ha ha. 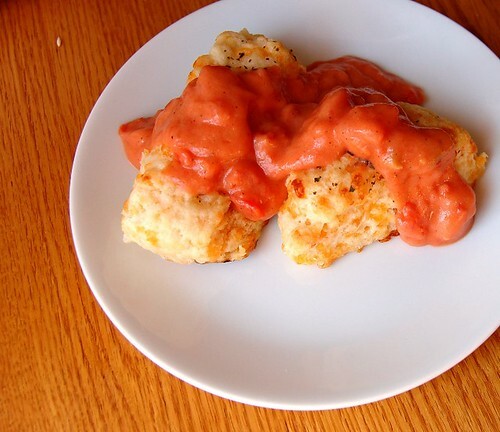 AWESOME, I just posted Tomato Gravy on my blog, could I also link to your recipe? 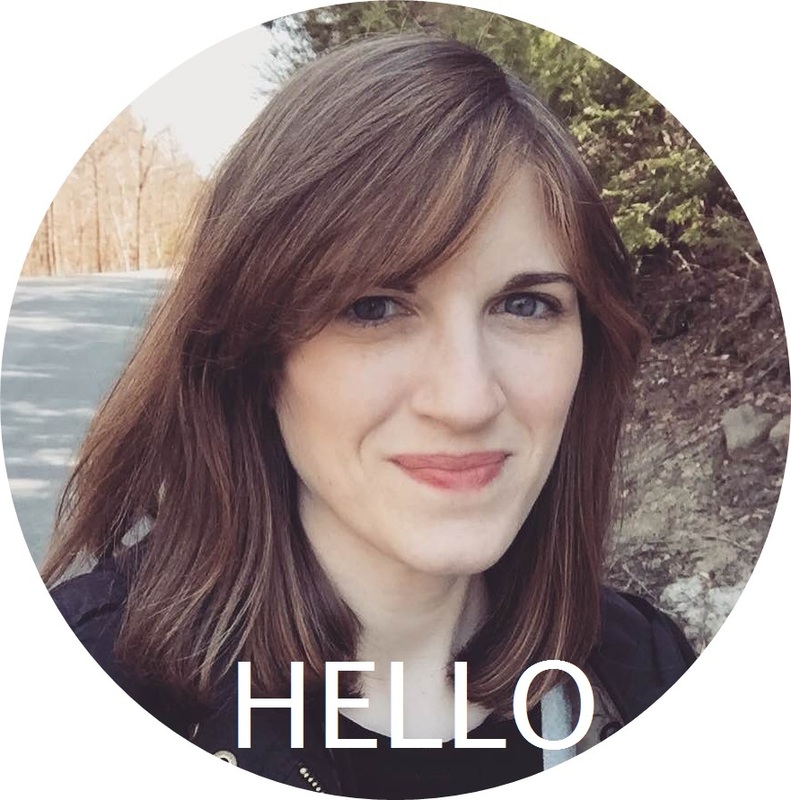 Hello Tofu_Mom! Absolutely! I love your name…I will be a tofu mom someday, too. 🙂 Can’t wait to check out your recipe! Just saw this Aim. Ben’s family recipe omits the milk and sugar. Instead after you make a roux with the flour you add diced onion and garlic. The roux should be at least the color of peanut butter and stirred constantly before adding anything to it. He adds a (mason jar) of tomatoes and equal parts water. I can scan you the entire recipe if you want. Anyway, Ben also adds that he believes that tomato gravy is traditionally served with rice. His dad started the tradition of serving with biscuits in his family. Also, Ben says the dish originated in south Mississippi – hence the Cajun influence with the roux. Thanks also for the background info! I knew I should have “interviewed” Ben the first time around. He is the expert, after all. I am intrigued by this recipe – can you send me the original too? thanks.